Dino-Lite Handheld Digital Microscopes Allow Users To Examine Objects With Great Detail For Medical And School Laboratories. Dino-Lite Handheld Digital Microscopes provide a high magnification at a nice working distance with the ability to reduce glare and produce advanced image quality for long lasting use. Durable plastic and metal construction provides high quality and reliability. Some models feature a touch-sensitive MicroTouch trigger to gives users the option of taking a picture right from the scope itself. Models with built-in LED lights can be turned on or off to illuminate objects. Available styles include Analog Eyepiece Camera, C-Mount Adapter, C-Mount Camera, Digital Eyepiece, Digital Eyepiece Camera, Edge Microscope, Handheld AV/Video, Handheld Composite, MicroTouch, and USB C-Mount Camera. Resolutions and magnification ranges vary per model. 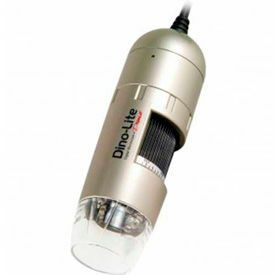 Dino-Lite Microscope Accessories Are Used In Laboratories, Medical Facilities And Science Applications. 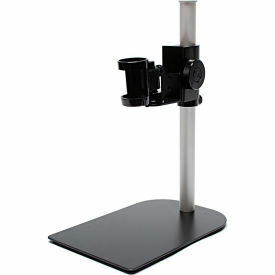 Dino-Lite Microscope Accessories include additional pole, aluminum enclosure, articulating desktop stand, attachment peg, accessories for iPad/iPhone, flexible arm and more. Color finishes include Black, Black/Silver, Clear, Silver and White/Silver. Measurements and applications vary per item. 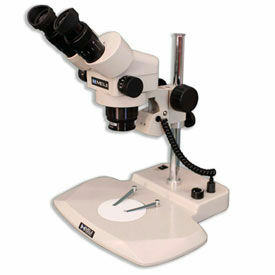 LW Scientific Microscopes Are Used For Physician And Veterinarian Clinics, Universities, Medical Schools And More. 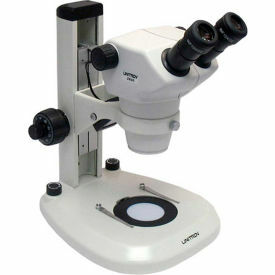 LW Scientific Microscopes is made with titanium-finished DIN achromatic or DIN Plan optics and a 30-year anti-fungal coating to provide long lasting durability. LED illumination provides for daylight color, and low heat, low power consumption, and super-long bulb life (30,000) provide optimum performance. Available styles include Bi/binocular Microscope, Binocular Stereomicroscope, Monocular Microscope, Achromatic Trinocular Microscope, Trinocular Microscope, Trinocular Stereomicroscope and more. Magnifications range from 3.5X-4.5X to 10X -30X. Scientific Microscope Cameras Are Used For Medical Clinics, Universities, Schools, Laboratories And More. Scientific Microscope Cameras are imaging systems for routine and research applications to provide precise monitoring and documentation of specimens and tissue. Made of plastic to provide long lasting durability. Available styles include MiniVD RCA Microscope Eyepiece Video Camera, MiniVID USB 2.0 Digital Eyepiece Camera, MiniVID USB 3.0 super Fast Camera and MiniVID WiFi Camera for iPhone,iPad, Android, Tablet and PC. Megapixels available are 5 and 5.1. Thus supporting all transmitted light contrasting methods such as Differential Interference Contrast (DIC), Phase Contrast (PH) or Brightfield Contrast (BF). And their color reproduction perfectly matches all kind of staining procedures. For fluorescence applications, we offer cameras designed to capture every photon emitted from the fluorescent specimen with as little background noise as possible. They allow sophisticated multidimensional acquisition and help generate fascinating insights into the dynamic processes of living cells. Meiji Techno Scientific Microscopes Are Used In Medical And Scientific Laboratories. 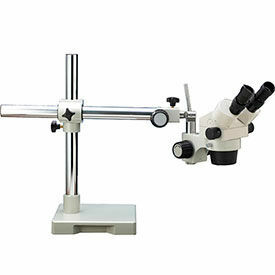 Meiji Techno Scientific Microscopes are made with plastic, and cast aluminum alloy to provide long lasting durability. 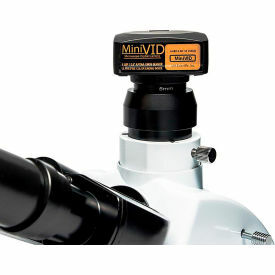 Compund Microscopes feature Monocular, Binocular and Trinocular body styles. Light sources are LED or Halogen. Other features include Complete Configured system with Microscope Body/Stand/Eyepiece, Turret Style Objective Changer with Triple Magnifications, Robust Alloy metal stand with smooth rack & pinion design, Ergonomically placed focus knobs Transmitted and incident LED illumination equipped with variable intensity. All optical parts are anti-fungus treated. Rubber Eyeguards and instruction manual for EM-30 model included. Objectives vary per model. Meiji Techno Microscope Accessories and Parts Are Used For Laboratory Microscopes For Medical And Scientific Applications. Meiji Techno Microscope Accessories and Parts are made with plastic, cast aluminum alloy and other materials to provide long lasting durability. Types include Articulated Arm Stand, Auxilliary Lenses, Boom Stand, Eyepiece and Filter. Lens magnifications vary per model. Features and functionalities vary per model. Luxo Microscopes and MIDAS® Capture And Document Images For Hospitals, Laboratories, Law Enforcement And More. Luxo's MIDAS® (Microscope Inspection Digital Application System) is a horizontally positioning digital handheld inspection system allowing the capture and documentation of images using a polarizing lens and 1.3 MP USB camera. System is designed for inspection, leak detection, criminology, currency verification, mineral examination and more. MIDAS® is ESD-Safe and suitable for use in static-sensitive environments. 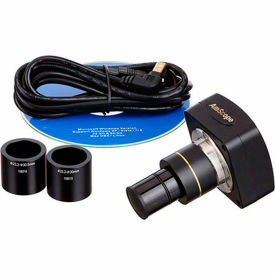 Available types are Digital Microscope and Stereo Zoom Microscope. Head types are Binocular, Digital and Trinocular. Magnifications include 10X - 200X, 6.5X - 45X and 7X - 45X. Working distances are 10X (150mm), 20X (95mm), 50X (13mm), 200X (2mm), 118mm and 95mm. Light sources are 150W Fiber Optic Illuminator w/ Ring Light, 17W Fluorescent Ring Light, 18W Dimmable LED-High Output Ring Light, 6 White-Light LEDs, 9W Dimmable LED Ring Light, 9W LED-3000 Ring Light and not included. Mouting options are Articulating Arm w/ Clamp, Dual Boom Stand, Gooseneck Stand and Single Boom Stand. Dimensions vary. UNITRON® Stereo Microscopes Allow Versatile Magnification For Applications Including Inspection, Research, Quality Control And More. 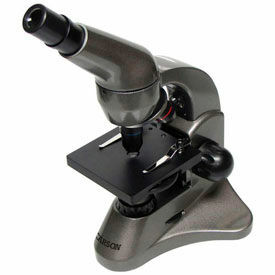 UNITRON® stereo microscopes are made of steel, aluminum and polyethylene for long lasting durability. 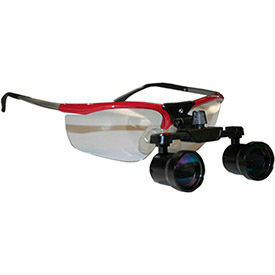 Optics, resolution, focus depth and large fields of view provide user accuracy and efficiency. 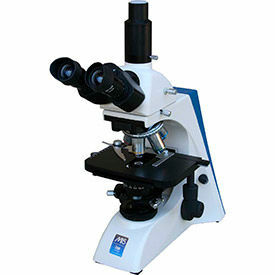 Microscope types include Z10 Ergo Zoom Stereo, Z10 Zoom Stereo, Z6 Ergo Zoom Stereo, Z6 Zoom Stereo, Z650HR Zoom Stereo, Z730 Zoom Stereo, Z8 Ergo Zoom Stereo, Z8 Zoom Stereo and more. Available head types are Binocular and Trinocular. Magnifications range from 6X-50X to 8X-80X. Zoom ratios are 10:1, 4.3:1, 6.3:1 and 8:1. Viewing head angles are 0° - 35°, 20°, 30° and 45°. Mounting stand options are Ball Bearing Boom, Boom, Coaxial Coarse/Fine Focus LED, E-LED, Flex Arm, LED, Plain Focusing and Pole. Available colors are Beige and Beige/Black. Dimensions vary per model. AmScope Compound Microscopes Enhance Visibility For Applications Including Medical, Laboratory, Educational, And More. 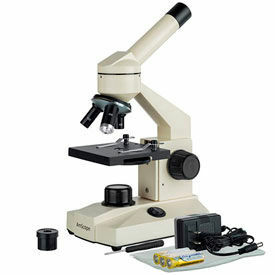 AmScope compound microscopes are made of high quality materials for dependability. Microscopes increase magnification for clinical examination and teaching demonstration in biological, bacteriological, and pharmaceutical environments. Units accommodate hospitals, clinics, collegiate institutes, and more. Various models include multiple magnification settings, coarse and fine focus, electrical illumination systems, digital cameras, and more. Power levels range from 40X - 1000X to 40X - 2500X. Optics are Achromatic, Infinity, and Plan/Infinity. Field Views are Extreme Widefield and Widefield. Styles and dimensions vary per model. Laboratory & Medical Loupes Are Used By Dental Lab Technicians, Hygienists, Electronics QC Inspectors Veterinary Technicians, Jewelry Makers, Doctors And Surgeons. Clip-On Clip-on loupes work on most prescription glasses. AmScope Accessories And Parts Provide Optional Microscope Equipment For Applications Including Medical, Laboratory, Educational, And More. 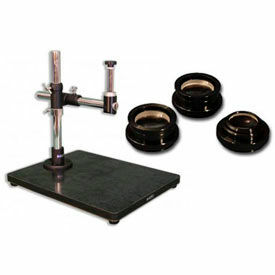 AmScope accessories and parts are made of high quality materials for dependability. Adapters improve visibility for various microscopes including compound, stereo, and more. Units accommodate monoculars, binoculars, and trinoculars. Ring lights provide even and bright illumination for enhanced image clarity. Video camera captures microscope images for high definition live video display. Available types are Adapter, Bulb, Camera, Case, Cleaning Kit, Dust Cover, Eye-Guard, Eyepiece, and more. Styles and dimensions vary per model.